We apologise for bombarding you with Korg news over the past couple of days, but there's one other significant development we need to tell you about. 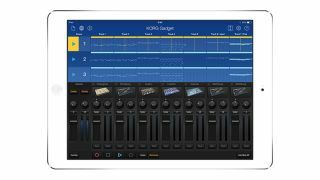 Gadget, the company's iPad music making app, has been updated to version 1.03. This might sound like a minor point release, but the new version - codenamed Santa Clara - adds some much-requested features and a few that we weren't expecting at all. Foremost of these is landscape mode - you can now use Gadget with your iPad on its side, which means more tracks can be seen at once. There's also proper MIDI control - all parameters can now be assigned to your hardware - while MIDI sync enables you to lock Gadget in with your DAW or other MIDI devices. Better still, the Ableton Live project export feature that's found its way into Korg's new Electribe grooveboxes is present in Gadget, too, giving you scope to take your projects further on the desktop. In fact, audio export options in general have been improved: you can now export the multitracks of your project rather than just a stereo mix. There's native 64-bit support, too, so users of the latest iPad should find that Gadget is optimised for the best possible performance. Finally, there are actually two new 'Gadgets' for you to play with: the Bilbao sample player and the Abu Dhabi loop slicer. You can find out more about these and the other new features in Gadget 1.03 Santa Clara on the Korg website. Obviously, this free update is a no-brainer for existing users, but if you're now more tempted by the app than you were before, you should be aware that it's on sale over the weekend at the reduced price of £19.99/$28.99. You'll find it on the Apple App Store.